Perfect sphere (low poly) bricks with smooth shading and spherical DTS collision (same mesh as the visual model). Only 54 quads per sphere. Sizes: 2x, 4x, 6x, and 8x wide. Height varies to make sure that the spheres are symmetrical and not elongated. Each side of a sphere touches the brick next to it for a snug fit. The brick grid for the spheres is minimal for maximum fun as seen the preview: bricks may be placed above and below the spheres as well as inside, immediately above and below the bottom and top. I.e. each sphere has a 2x2f plate at the top and bottom. Coverage is minimal, only the top and bottom quads are hidden when covered. This is a sample brick for Blender BLB Exporter and Blender DTS Importer/Exporter. Layer 6 contains the collision and raycast collision meshes for the spheres (i.e. 2 each) to be exported using the Blender DTS Exporter. To export them, you need delete all other objects from the scene, only leaving the two objects to export. Default settings are fine. Additionally the Blender file includes the camera, light, and material used for rendering special brick icons that closely match the default Blockland style. Icon is to be rendered without anti-aliasing. Post-processing is required to scale the icon to the correct resolution using bilinear interpolation. Have wanted someone to make these since Uxie made the single one many years ago. 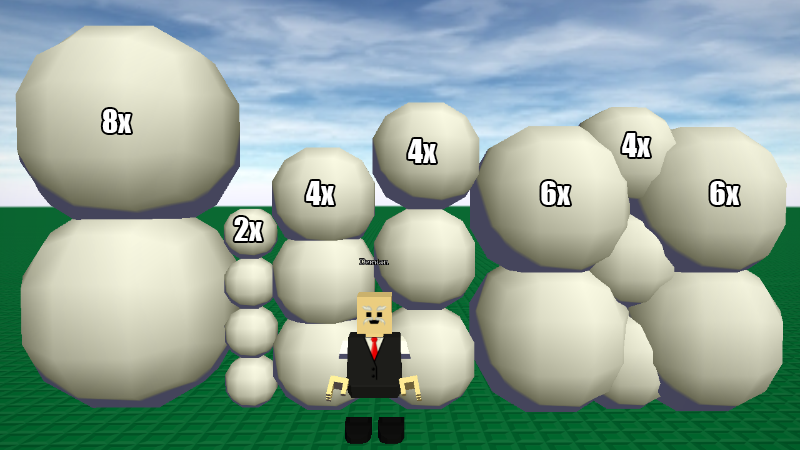 They look good, but spheres just don't fit blockland...although they're pretty sweet and spiffy. would it hurt to ask for 16x 32x and 64x variants? ?